At one end of the ground is the newest and largest stand, the impressive looking Richard Donald Stand, named after a former Club Chairman. It was opened in 1993 and replaced what was known as the Beach End. This is two tiered with a row of executive boxes running across the middle. There is a particularly large lower tier, with a smaller upper tier and overall this stand tends to dwarf the others around it. The other end is a much smaller older single tiered stand called the Merkland Stand. On one side is the old Main Stand, originally built in 1925. As you would expect from an older stand, it has a fair few supporting pillars running along the front of it. Opposite is a large single tiered cantilever stand, called the South Stand. The corner between this and the Merkland Stand is filled with seating, but this area is the only uncovered area of the ground. The Club in partnership with Aberdeen City Council have announced proposals to build a new stadium near Loirston Loch. The proposed community stadium, which is very much still at the drawing board stage, would have an initial capacity of 22,000, which could be increased to 30,000 at a later time. Pittodrie would be sold off for residential re-development. Away fans are housed on the one side of the South Stand. Up to 4,500 supporters can be accommodated in this part of the ground (although the normal allocation is around 2,500). Peter Llewellyn adds 'there is normally an excellent atmosphere within Pittodrie, although it is sometimes lacking for the smaller games'. I think Pittodrie gets the vote as one of the most coldest grounds in Britain. Even in spring the biting breeze off the North Sea which is only a few hundred yards away from the perimeter of the ground, can go right through you. Outside look out for the granite entrance to the Merkland Family Stand. Erected in 1928 they celebrate Aberdeen being known as the 'Granite City'. There are not that many pubs nearby, so consider drinking in the city centre before moving onto the ground. Scott McKenzie informs me; 'The nearest bar to the ground is the Broad Hill bar at the back of the Richard Donald Stand, but unfortunately this has a big sign up saying "home support only", although it hasn't always been that way. Next closest are the three Golf Clubs, all of whom operate a signing in/membership type thing, which some away fans do take advantage of and the atmosphere is invariably friendly. If travelling by coach, then all coaches are parked on the beach boulevard, which is close to a bar called 'The Saltoun' which is popular with away fans. Otherwise there are plenty of bars to chose from in the city centre'. The ground is located in the North part of the city (close to Old Aberdeen) and near to the coast line. It is close to the A956. Follow the A90 towards Aberdeen. Just south of Aberdeen join the A956. Keep on the A956 through Aberdeen and eventually you will come to Pittodrie over on your right. Turn right into Pittodrie Street for the ground. Follow the A956 into Aberdeen. You will reach Pittodrie over on your left. Turn left into Pittodrie Street for the ground. Follow the A96 into Aberdeen. At the large roundabout with the A978 turn left into Machar Drive (A978). Proceed along the A978 and then turn right onto the A956 (King Street). 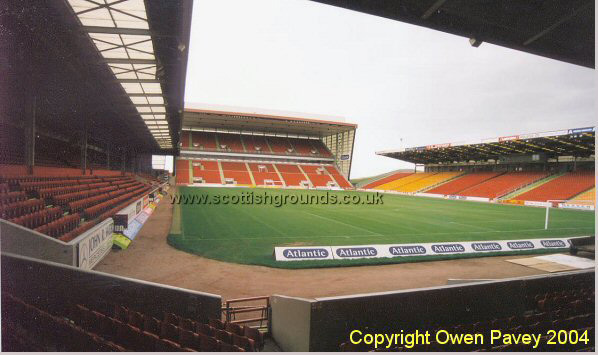 Pittodrie Street and the ground is the 5th turning on the left. There is a large car park at the ground but this is for pass holders only. There is though a fair amount of street parking in side streets and on the Esplanade along the sea front, which is on the other side of the golf course. Upon leaving the station turn left and walk across the bridge and then turn right. This brings you into Union Street, where you should walk down until its end, where you will reach Castle Gate. Home supporters should bear left into King Street (A956) and continue down this street before turning right into Merkland Road for the ground. Away supporters should proceed through the Castle Gate and into Park Street. This street eventually becomes Golf Road and you will come to Pittodrie on your left. Thanks to Tom Widdows for providing the directions. Although not local in distance, Glasgow Rangers. Please note that Family & Under 12 tickets must be purchased from the Customer Services Department. Ten Men Went To Mow (10MWTM) �1. For the Aberdeen fixture list click here (to take you to the BBC Sports Website). 26 wheelchair spaces are available in front of the Richard Donald & Merkland Road Stands, plus seven more in front of the away section. These also include provision for one helper per wheelchair space. Disabled fans are admitted free, although helpers are required to pay. Disabled toilet facilities are available in these stands. Places need to be booked in advance by calling 01224 650423. Scottish Cup, March 3rd 1954. If you require hotel accommodation in the area then first try a hotel booking service provided by Football Hotels who are powered by Activehotels, who specialise in locating accommodation near or within a short travelling distance of the football ground. They also have the added advantage over some other hotel booking services that you pay on departure. Yes this site will earn a small commission if you book through them, but it will go to help with the running costs of keeping the Guide going. To access their Aberdeen page click here.